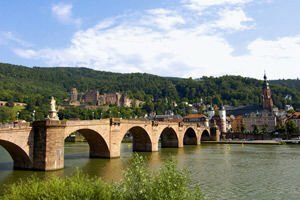 City of Heidelberg is picturesquely located in the beautiful valley of the Neckar River, halfway between Frankfurt and Stuttgart. This German city known as the university center has a lot of history. For the first time it is mentioned in historical texts in 1196. During World War II Heidelberg managed to keep from shells and bombs. Today the city has a unique old part, which is located on the left bank of the Neckar River at the foot of the hill which is one of the last parts of the Black Forest. Undoubtedly the biggest attraction is Heidelberg Castle. It is one of the most famous and popular attractions in southwest Germany. Heidelberg Castle rises majestically with its pastel reflections in between the old neighborhoods of the city and hills. The castle is first mentioned in 1225 when it was built at different stages in its contemporary form, it bears the marks of several architectural periods. After Charles Philip came into conflict with the towns protestants because of handing over the Church of the Holy Spirit to the Catholics, in 1720 he was then primarily on the basis of a disagreement with the prevailing community provoking Heidelberg being moved to the capital in the newly founded Mannheim as the palace ceased to perform official functions. The palace was destroyed many times after the last burst with the French during the Nine Years War in 1693 and was abandoned. The architecture of the castle of Heidelberg is a strange mix of styles and ages between 13th and 17th century, the main part of the palace was built in the spirit of the German Renaissance. The King restored the building including the hall and the palace chapel, which still serves for holiday celebrations and exhibitions. In the basement of the castle is a huge barrel that collects exactly 221, 726 liters of wine. Today the Heidelberg Castle attracts tourists from around the world. There are two ways to get to the palace. One is using the lift that goes from the old town which takes you to the television tower and the other is on foot through the narrow, scenic path along the slope. In the very beginning of the journey you will see a sign with the inscription, which states that you have 1035 Feet left to reach the palace. The climb is tiring but the view to the castle and town from the spacious terraces is well worth the effort.